Isn’t it great to find technology that helps you save and manage your time? But there are so many apps out there claiming they can do just that. Out of the numerous options, only one has stood out among the rest and proven to be the best. The only app that has significantly impacted my business for the better is Slack. Slack is messaging for teams. You can use it on your computer and your phone, and it keeps all communication in one place. Slack reduces annoying emails and time/soul-sucking meetings. All of the Realtors in my Brokerage at Reilly Realtors have access to our “Brokerage Team”. All the conversations are organized into differently labeled channels. For example, one channel in my office is labeled “Open House”. This allows a listing agent to post their listing to see if anybody in the office would like to hold an open house for them. Another channel we use is “Your Buyer Needs”. I can post what my buyer client is looking for and if another Realtor in my office has a listing coming up, they can let me know. Those are both public channels, so anybody can see them. You can also manage what you would like to have access to. If you’re not interested in a channel, you can unsubscribe from it. If you’re very interested in getting notifications for a channel, you can change the settings to be notified every time somebody posts in that particular channel. If there is a project that only a few agents are working on, they can create a private channel and invite a few members into it. You can also direct message one person or a group. I did this just today to continue a conversation I had in a public channel labeled “Deal-Contract advice”. Instead of having a long back and forth conversation with one agent in a public channel, I took it to a private direct message channel, and we continued our conversation there. 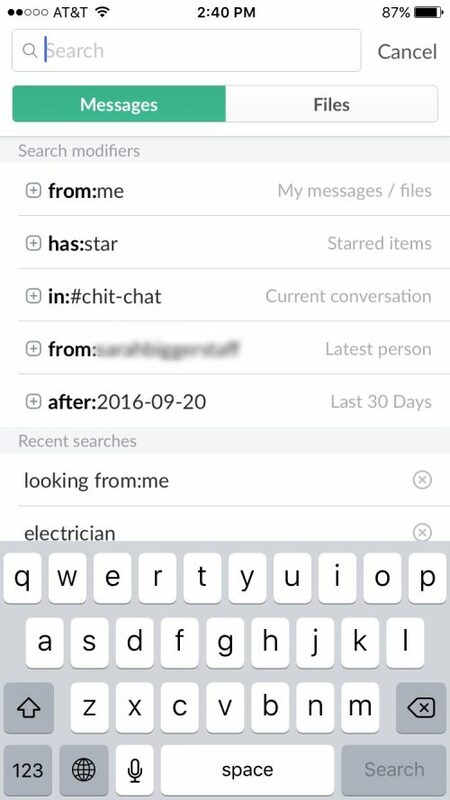 I love the search feature in Slack. As a Realtor, there’s so much you need to know to better guide and assist your clients. Keeping up with different builders, new construction, best/worst HOA’s, lenders, inspectors. The list goes on and on. Now I have the best resource. Not only can I get a second opinion on a question my client has asked, BUT I can also search my team’s entire Slack database to see if somebody has asked my question before. I recently was interested in learning more about a particular builder my client was interested in hiring. I typed in the builder’s name in the search engine, and five conversations popped up that agents in my office previously had about that builder. You can also upload files. Such a great resource! How my brokerage uses slack. We have many different helpful channels. Before Slack, our operations team or broker would send out emails. This wasn’t the best approach because the emails didn’t always apply to everybody. But my Company wanted to keep everybody in the loop. Slack was the best solution. This summer I went on a few vacations. It seemed that every time I was not in Austin, a client would see a house they loved online and needed to see it in person ASAP! You’d think that would be an issue, but it wasn’t a problem at all. I was able to get on our “Showing Help” channel on Slack and quickly find somebody in my office who could help me out. An agent in my office even wrote up an offer for me! Slack creates a “team environment”. Although we technically have our own real estate businesses, Slack helps us feel more like a unit. We all work together. I love our “Chit-Chat” channel. As a Realtor, I usually work by myself and sometimes that can be lonely! I don’t have a group of coworkers I collaborate with every day. Not many people understand your day to day work life unless they are in the same industry as you. The chit-chat channel is somewhat like texting with your friends. People post about their day or what they’re doing. I haven’t met all of the Realtors in my brokerage, we all work in different parts of Austin and the surrounding area. It’s a nice way to stay connected. It’s always nice to get a second opinion. Whether that be about an unfamiliar vendor your client is working with or an inspection report from hell. With Slack, I will always be able to answer a question for a client. Even if I’m not 100% sure on the answer, they know I will be able to get one to them in a couple of hours…but usually in just a couple of minutes! When a client uses my services, they are rest assured that I will be one of the best agents in Austin to help them buy or sell a home. You know why? I can get the diverse opinions and ideas from many other top performing agents in Austin, and I can get answers FAST. This tool is great because it combines experienced professionals with technology. Nobody knows the answers to everything but in a group effort you can better serve your clients and give them many options. It’s best to work together with your fellow agents and coworkers. I think this applies to most industries. Grow partnerships and relationships within your field. I love how real estate is changing. And I’m very excited to see what else technology has in store for the industry. Do you use Slack at your company? I’d love to hear how and what your experience is with it.